Citation Information: JCI Insight. 2016;1(19):e90931. https://doi.org/10.1172/jci.insight.90931. Bcl-2–associated athanogene 3 (BAG3) is an evolutionarily conserved protein expressed at high levels in the heart and the vasculature and in many cancers. While altered BAG3 expression has been associated with cardiac dysfunction, its role in ischemia/reperfusion (I/R) is unknown. To test the hypothesis that BAG3 protects the heart from reperfusion injury, in vivo cardiac function was measured in hearts infected with either recombinant adeno-associated virus serotype 9–expressing (rAAV9-expressing) BAG3 or GFP and subjected to I/R. To elucidate molecular mechanisms by which BAG3 protects against I/R injury, neonatal mouse ventricular cardiomyocytes (NMVCs) in which BAG3 levels were modified by adenovirus expressing (Ad-expressing) BAG3 or siBAG3 were exposed to hypoxia/reoxygenation (H/R). H/R significantly reduced NMVC BAG3 levels, which were associated with enhanced expression of apoptosis markers, decreased expression of autophagy markers, and reduced autophagy flux. 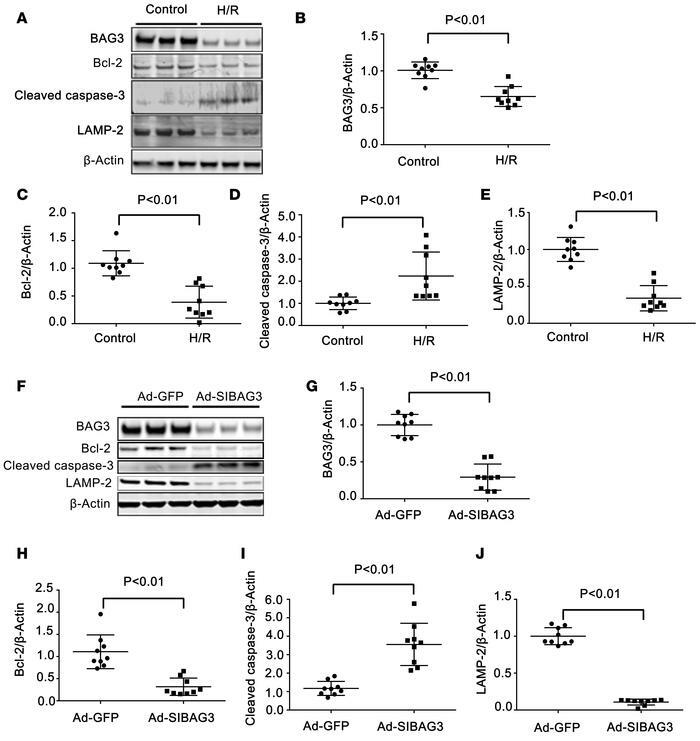 The deleterious effects of H/R on apoptosis and autophagy were recapitulated by knockdown of BAG3 with Ad-siBAG3 and were rescued by Ad-BAG3. In vivo, treatment of mice with rAAV9-BAG3 prior to I/R significantly decreased infarct size and improved left ventricular function when compared with mice receiving rAAV9-GFP and improved markers of autophagy and apoptosis. These findings suggest that BAG3 may provide a therapeutic target in patients undergoing reperfusion after myocardial infarction. BAG3 reduction by hypoxia/reoxygenation or siRNA decreases autophagy but increases apoptosis markers in neonatal mouse cardiomyocytes.